I want to start this post with a quick review of where we should be right now…provided that we’ve been making the suggested number of stars each week. Which I haven’t been, so please don’t let these numbers discourage you. I was taking stock of my own progress and thought it would be a good idea for everyone to get a sense of the numbers. Not including this post, we have now done 10 star variations. So if you’ve been working at the rate suggested at the beginning of this whole thing, that means that you should have 10 large stars, 20 medium stars and 50 small stars. That means that you have 5 large, 8 medium and 18 small stars left to go. Now, you might notice that if you followed the current schedule, you would end up with 5 large, 10 medium and 25 small stars, which is too many! But isn’t it nice that you can slow down a bit and coast towards the finish line?! So just keep this in mind as we work through the last 5 variations. 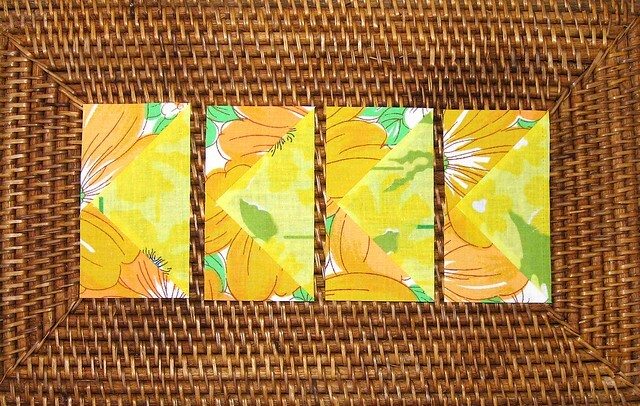 The 3″ squares of fabric #3 (yellow) will each be cut into 2 half-square triangles, and the large 7-3/8″ square of background fabric will be cut into 4 quarter-square triangles. 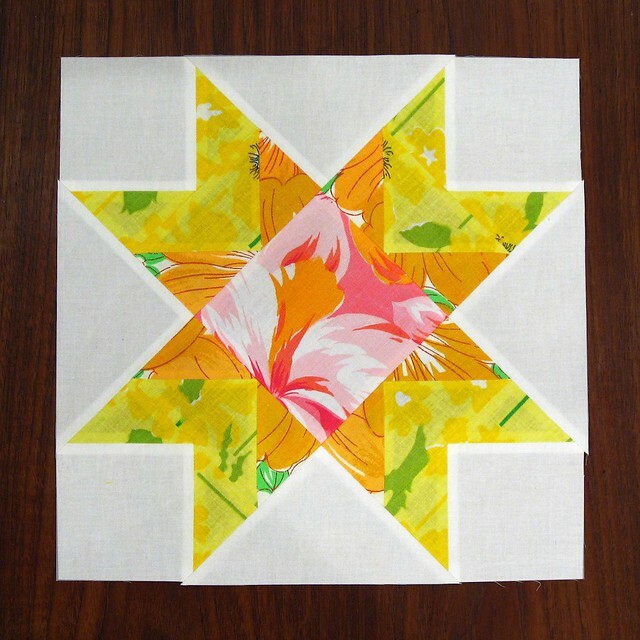 To begin, we’re going to make 4 flying geese, using the method outlined for the Basic Star. 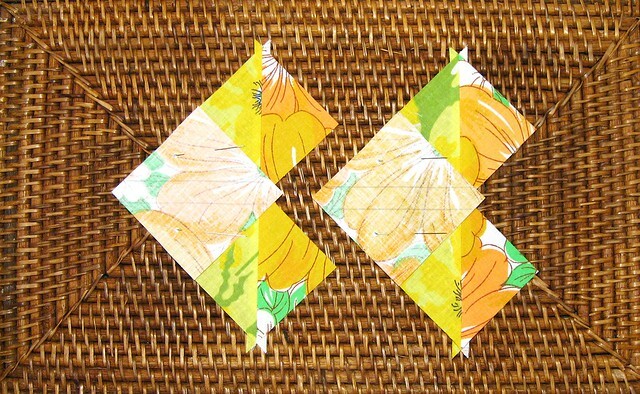 But in this case, rather than using both foreground and background fabrics, we’re just going to use foreground fabrics. 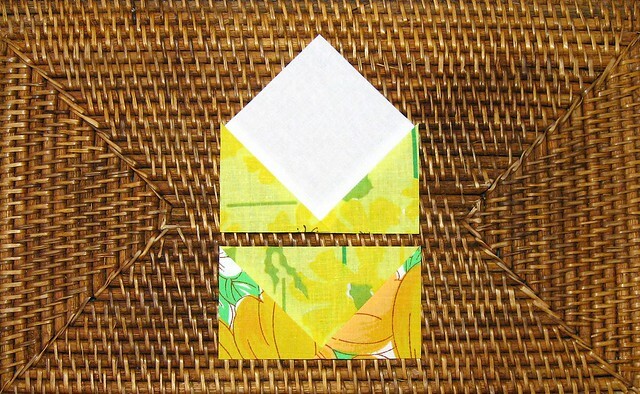 Use the 5-1/2″ square of fabric #3 (yellow) and the 3″ squares of fabric #2 (orange). 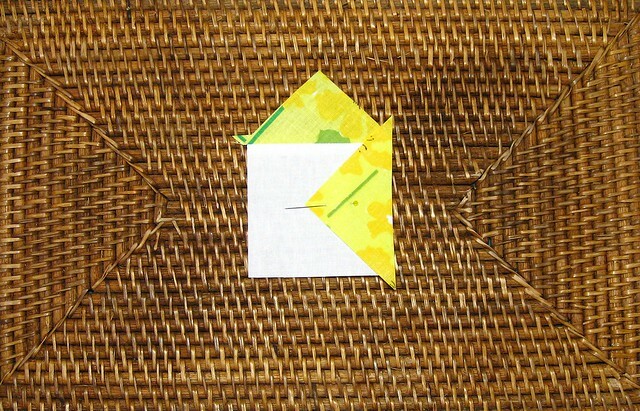 Next, we’re going to assemble four (4) “envelope” units to make the star points. 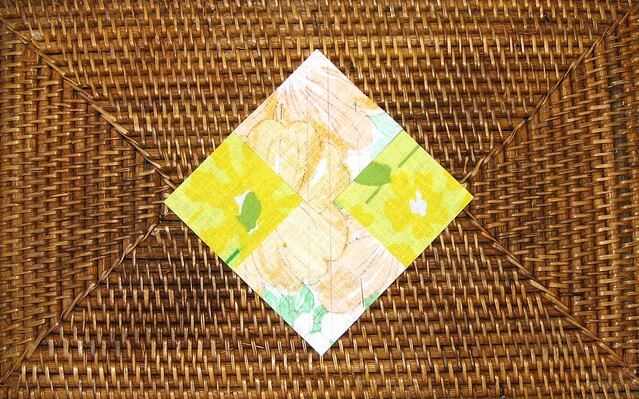 Begin by cutting the 3″ squares of fabric #3 (yellow) into HSTs, and then attach them to the 3-1/2″ squares of background fabric. 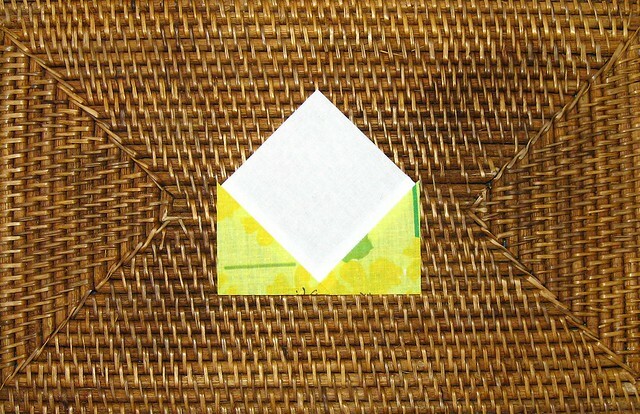 The edges should align, and the point of the triangle should be in the centre of the square. Unfortunately, there are no seams to tell us where that is, so you can use a ruler, or mark the square with a water-soluable marking pen. When adding the second triangle, make sure to measure to the centre from the outside edge, since the edge attached to triangle #1 now has the seam allowance involved, and is therefore closer to the finished centre. Clear as mud?! 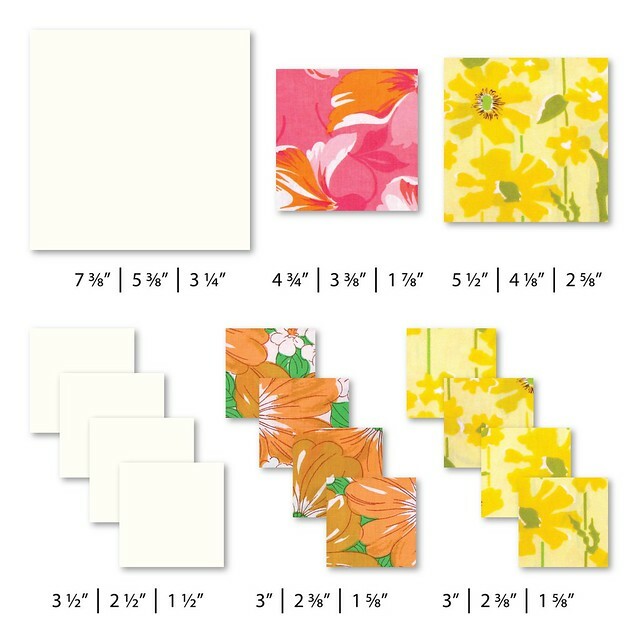 The finished envelope units need to be trimmed to 4-3/4″ wide. 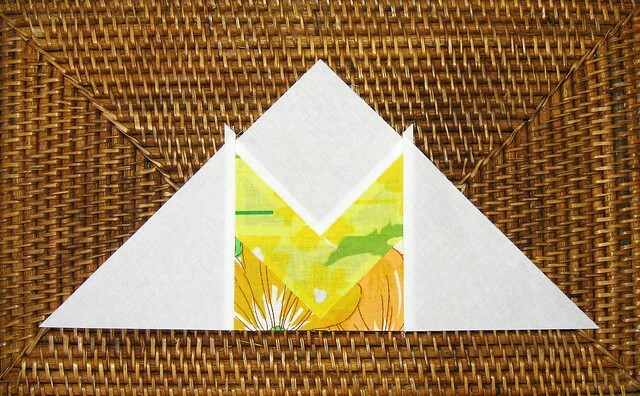 When you have both the geese and the envelopes finished, sew them together so that fabric #3 creates a chevron shape. 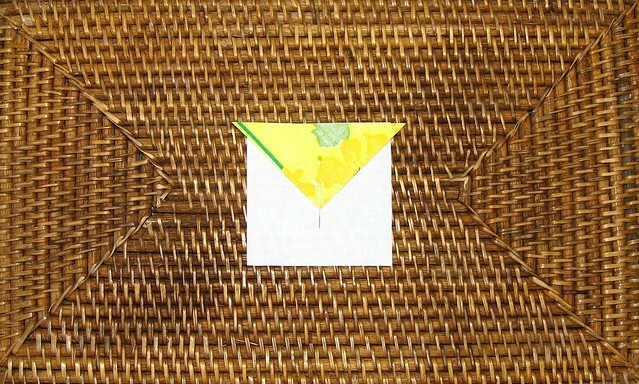 From this point forward, the construction is the same as the Woven Star. 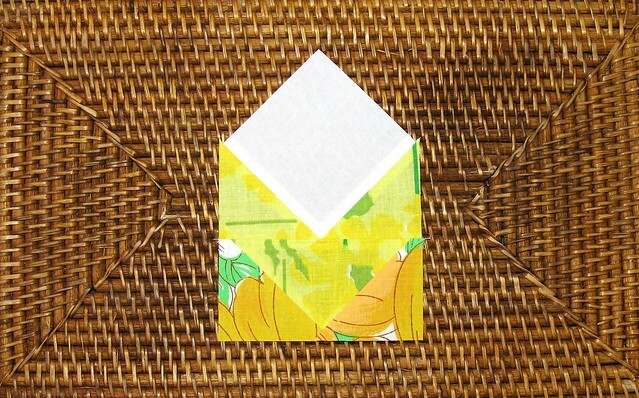 Use the QSTs of background fabric to create two larger triangles with two of the envelope units in the centre of each one. 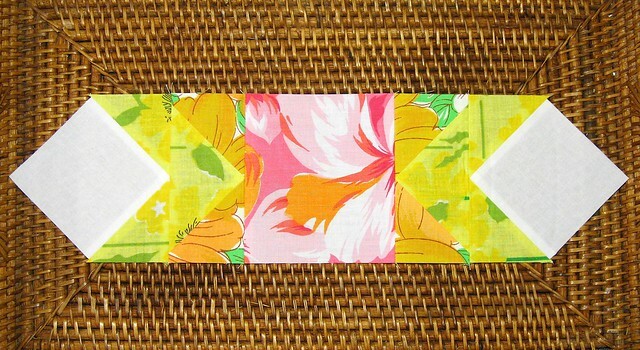 Then attach the remaining two envelope units to either side of the 4-3/4″ square of fabric #1 to create the centre strip. Then sew the three large components together to complete the star! Only four more to go…are you getting excited to put it all together? I know I am!